The Darriwilian is the upper stage of the Middle Ordovician. It is preceded by the Dapingian and succeeded by the Upper Ordovician Sandbian stage. The lower boundary of the Darriwilian is defined as the first appearance of the graptolite species Undulograptus austrodentatus around 467.3 million years ago. It lasted for about 8.9 million years until the beginning of the Sandbian around 458.4 million years ago. The name Darriwilian is derived from Darriwil, a parish in County of Grant, Victoria (Australia). The name was proposed in 1899 by Thomas Sergeant Hall. Map of China showing the GSSP location. 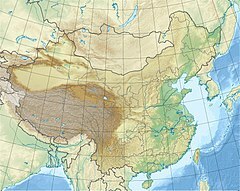 The GSSP of the Darriwilian is the Huangnitang Section (28°51′14″N 118°29′23″E﻿ / ﻿28.8539°N 118.4897°E﻿ / 28.8539; 118.4897) near the village Huangnitang, 3.5 km southwest of Changshan County Town (Zhejiang, China). It is an outcrop of the Ningkuo Formation, consisting of mainly black shale. The lower boundary of the Darriwilian is defined as the first appearance datum of the graptolite species Undulograptus austrodentatus in that section. A Secondary fossil marker is the graptolite Arienigraptus zhejiangensis. The base of the Darriwilian is also the base of the Undulograptus austrodentatus graptolite zone. This zone lies just above the North Atlantic Microzarkodina parva conodont zone. The base also lies in the upper part of the North American Histiodella altifrons conodont zone. The Undulograptus austrodentatus graptolite zone is known from outcrops around the world, making the base of the Darriwilian easily correlatable. The Darriwilian overlaps with the upper Arenig and the Llanvirn. The base of the Darriwilian can be correlated with a level in the Fennian stage of the Arenig. ^ "GSSP Table - Paleozoic Era". Geologic Timescale Foundation. Retrieved 30 November 2012. ^ a b c d "GSSP for Darriwilian Stage". Geologic Timescale Foundation. Retrieved 30 November 2012. ^ Gradstein, F. M., ed. (2012). The Geologic Time Scale 2012. Elsevier Science Ltd. p. 1176. ISBN 978-0444594259. Retrieved 30 November 2012.